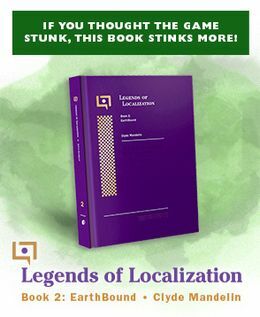 As I posted about before, I’m considering turning my various Legends of Localization projects into actual, physical books someday, and if I do that, these MOTHER 3 notes will probably be the first one I do. If everything works out (and I actually manage to finish the notes) then I’ll probably include even more bonus content or goodies or something too. That’s way, way down the line though, so for now, go read until your eyes fall out here! Never heard of an arquebus before, Mato? Perhaps you should read up on some sengoku era history with a book called “Giving Up the Gun” by Noel Perrin. Cool I’ll go look at these right now, just remember what C.W. Fields said: “If you try again and again and you still fail, just give up, don’t be stupid about it”. Or something like that. Veil Gluck on your pursuits. I thought you worked for Funimation not 4kids! Think it would be a good idea to link it on the “Notes” page on the Mother 3 Translation site? Or maybe a redirect? Oh my god I am way too excited for this. Four and a half years later, worth it. Also the alt text to the images is just fantastic. …but really, I can’t believe kind, sweet Hinawa had a wild affair with the Reconstructed Caribou. I guess opposites do attract! Thanks so much for sharing all of this. It’s a really awesome read and absolutely fascinating. Things like the standard nomenclature for buttons, directional pads, etc. are things we hardly notice precisely because of the attention to detail. Calling it out and bringing attention to it is really cool. Book, webpage, or whatever forms you choose to distribute in, I look forward to learning more. Something tells me you didn’t do much work on anime for kids, did you? I was hoping my favorite anime would be on there, oh well, but on the bright side I have a friend who is fan of the Kingdom Hearts series. She is gonna flip when I tell her I indirectly know the guy who worked a little bit on Kingdom Hearts 2 translation. On an actual note, Mato, what is your favorite translation project (that you were involved in [ if a Mother project is the answer your favorite non-Mother translation]). Thanks in advance for the answer. Tomato, you made me smile with ” Welcome to 😐 “. Speaking of that, if we really want to find crazy picky stuff, it was “Welcome to th:|” originally. Minute nitpicking aside, this really is great and I can’t wait to see the rest! It's interesting to hear that you're unsatisfied with Hinawa's letter — whenever I played this for the first time I thought it was just the most precious thing (and definitely wasn't lifeless)! NecrosaroIII: Thanks for the info. Hinawaju actually came up recently in some other translation work I did, so it sounds like it’s tied to Japanese history pretty well. If there’s a library nearby I’ll see if I can get the book you recommended. Jungyin: Yeah, I’ll update that sometime. AdmiralCrunch: Thanks, I fixed it. I actually only skimmed everything over once before posting it just because I wanted it up finally. Then I started seeing all kinds of little things like that, although I think I’ve fixed most of them now. Apple Kid: It’s really hard to say since I’ve worked on so much. I like sci-fi stuff, so it’s maybe a tie between S.T.R.A.I.N, Summer Wars, or Steins;Gate. At least in terms of “what thing that I’ve worked on do I like the most”. gBev: Oops! Thanks, I fixed it. It was overused for so long that I lost full memory of it. Jared: Thanks, I’m genuinely glad to hear that – it’s hard to step out of my critiquing standpoint, so it’s nice to see/hear when people like stuff that I felt I did poorly on. It gives me a little bit of a boost! and I greatly anticipated your in-depth view on one of your own projects. 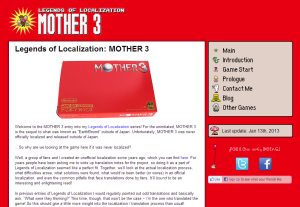 Your articles about these localisations, and the beginning of your view on Mother 3 does deliver in that regard as well, exceed in what, to me, makes a good article: They are informative and entertaining all the same. I thank you for taking you precious time to write these for us, and I hope you continue on being awesome. Summer Wars was a really good movie. Clyde DUANE Mandelin?! You sure have a cool name, Tomato. 357: That’s just part of the house – it doesn’t show up in the Japanese screenshot because the screen hasn’t scrolled the same amount downward as in the English screenshot. I now have to start a naval war with Mato. The alt text has brought me to tears. @Mato would you ever like to translate games from English to Japanese? I’ve thought about doing it for StarTropics, I think that would be neat. The part where you added the EarthBound-esque protection was an absolute surprise! Also, when I did read some of this, I really feel thankful that this translation was released in the first place, and how far you (and Jeff) went to make it work. Mother 3 is an —>*awesome*<— game! will you be giving updates on this site for significant progress on the notes, or should we all just check it ourselves obsessively? Oh, I’ll definitely post about new updates on here, just like I did with my Mother 2/EarthBound updates. Interesting details on that name confirmation screen. I still wonder if the actual fade to black itself couldn’t be disabled, or delayed until after the sounds were done playing. Would that work, or would changes like that be hidden too far in the hex to find easily? Stuff like that is hard to work with. When it comes to ROM hacking, messing with data is the easiest, everything else is hard. I understand completely. Finding a recognizable data block must be a far simpler task than decoding and recoding actual functions from raw hex. Much like having the source code would have negated the need to work around the odd text system in the first place. Shame though.